Pokémon sī chi̍t hē iû-hì kap tōng-ōe chok-phín, lāi-bīn ū chi̍t thò khong-sióng seng-bu̍t to̍h kiò pokémon, pún bûn-chiong sī chia seng-bu̍t ê lia̍t-toaⁿ. Kui-ê chhòng-chok lāi-té, lóng-chóng hâm 7-pah gōa khoán ê "chéng" (species). Ē-bīn ê Zyôto (ジョウト), Hôen (ホウエン), Sinô (シンオウ), Issyu (イッシュ) sī kò͘-sū lāi-bīn ê kî-tiong 4-ê tē-hng. 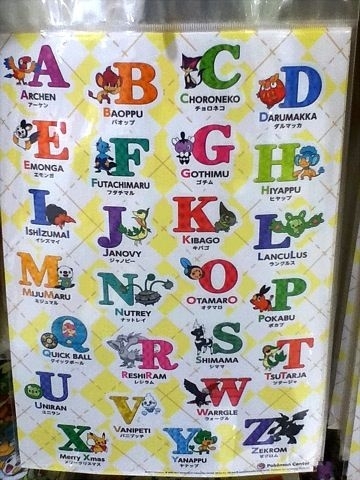 Pokémon ê hō-miâ ùi pún lia̍t-toaⁿ lāi hun "Eng-gí" kap "Ji̍t-pún" nn̄g khoán. 122 Mr. Mime Barrierd 158 – 095 – 122bNn̄g/Mime Jr.
↑ 1.00 1.01 1.02 1.03 1.04 1.05 1.06 1.07 1.08 1.09 1.10 1.11 1.12 "キメわざポケモンキッズDP3". Bandai Co., Ltd. (via WebCite). June 2009. 28 July 2010 khòaⁿ--ê. ↑ "Pokémon! Kimi ni Kimeta!". Pocket Monsters. Season 1. Episode 1. ↑ 4.0 4.1 4.2 4.3 4.4 4.5 4.6 4.7 4.8 "キメわざポケモンキッズ7". Bandai Co., Ltd. (via WebCite). September 2007. 28 July 2010 khòaⁿ--ê. ↑ 6.0 6.1 6.2 6.3 6.4 6.5 6.6 6.7 6.8 6.9 "キメわざポケモンキッズ5". Bandai Co., Ltd. (via WebCite). October 2006. 28 July 2010 khòaⁿ--ê. ↑ 8.0 8.1 8.2 "Index of /wp-content/uploads/2010/12". Ptcg.creatures.co.jp. 2011-04-05 khòaⁿ--ê. ↑ "かくれとくせい」にクローズアップ！". Monthly PGL. The Pokémon Company. December 2010. 3 December 2010 khòaⁿ--ê. ↑ 10.0 10.1 10.2 10.3 10.4 10.5 10.6 "キメわざポケモンキッズ6". Bandai Co., Ltd. (via WebCite). March 2007. 28 July 2010 khòaⁿ--ê. ↑ 13.0 13.1 13.2 13.3 13.4 13.5 13.6 13.7 "キメわざポケモンキッズ8". Bandai Co., Ltd. (via WebCite). March 2008. 28 July 2010 khòaⁿ--ê. ↑ 14.0 14.1 "2000年 結晶塔の帝王". ポケットモンスターオフィシャルサイト. The Pokémon Company. 30 December 2010 khòaⁿ--ê. ↑ 15.00 15.01 15.02 15.03 15.04 15.05 15.06 15.07 15.08 15.09 15.10 15.11 "キメわざポケモンキッズ2". Bandai Co., Ltd. (via WebCite). January 2006. 28 July 2010 khòaⁿ--ê. ↑ 16.00 16.01 16.02 16.03 16.04 16.05 16.06 16.07 16.08 16.09 16.10 16.11 16.12 16.13 16.14 "キメわざポケモンキッズDP5". Bandai Co., Ltd. (via WebCite). May 2010. 28 July 2010 khòaⁿ--ê. ↑ 17.00 17.01 17.02 17.03 17.04 17.05 17.06 17.07 17.08 17.09 17.10 17.11 17.12 17.13 17.14 "キメわざポケモンキッズ4". Bandai Co., Ltd. (via WebCite). July 2006. 28 July 2010 khòaⁿ--ê. ↑ 18.0 18.1 18.2 18.3 18.4 18.5 "ポケモンメダルコレクション ダイヤモンド＆パール４". Bandai Co., Ltd. 18 April 2011 khòaⁿ--ê. ↑ "2001年 セレビィ 時を超えた遭遇". ポケットモンスターオフィシャルサイト. The Pokémon Company. 30 December 2010 khòaⁿ--ê. ↑ 20.00 20.01 20.02 20.03 20.04 20.05 20.06 20.07 20.08 20.09 20.10 20.11 "キメわざポケモンキッズDP4". Bandai Co., Ltd. (via WebCite). December 2009. 28 July 2010 khòaⁿ--ê. ↑ 21.00 21.01 21.02 21.03 21.04 21.05 21.06 21.07 21.08 21.09 21.10 21.11 21.12 21.13 "キメわざポケモンキッズ". Bandai Co., Ltd. (via WebCite). October 2005. 28 July 2010 khòaⁿ--ê. ↑ 29.00 29.01 29.02 29.03 29.04 29.05 29.06 29.07 29.08 29.09 29.10 29.11 29.12 "キメわざポケモンキッズDP". Bandai Co., Ltd. (via WebCite). December 2008. 28 July 2010 khòaⁿ--ê. ↑ 31.0 31.1 31.2 "キメわざポケモンキッズ3". Bandai Co., Ltd. (via WebCite). April 2006. 28 July 2010 khòaⁿ--ê. ↑ 34.00 34.01 34.02 34.03 34.04 34.05 34.06 34.07 34.08 34.09 34.10 34.11 "キメわざポケモンキッズDP2". Bandai Co., Ltd. (via WebCite). March 2009. 28 July 2010 khòaⁿ--ê. ↑ 54.0 54.1 54.2 "Starter Pokémon". Pokémon Black Version and Pokémon White Version: Official Video Game Site. The Pokémon Company International, Inc. 23 November 2010 khòaⁿ--ê. ↑ 55.00 55.01 55.02 55.03 55.04 55.05 55.06 55.07 55.08 55.09 55.10 55.11 55.12 55.13 55.14 55.15 55.16 55.17 "ポケモンメダルコレクション ベストウイッシュ". Bandai Co., Ltd. goân-loē-iông tī 30 December 2010 hőng khó͘-pih. 6 October 2010 khòaⁿ--ê. ↑ "Pokémon Black Version and Pokémon White Version | Patrat". 2011-11-14 khòaⁿ--ê. ↑ "Pokémon Black Version and Pokémon White Version | Watchog". 2011-02-07 khòaⁿ--ê. ↑ "Pokémon Black Version and Pokémon White Version | Lillipup". The Pokémon Company International, Inc. 2011-02-10 khòaⁿ--ê. ↑ "Pokémon Black Version and Pokémon White Version | Herdier". The Pokémon Company International, Inc. 2011-02-10 khòaⁿ--ê. ↑ "Pokémon Black Version and Pokémon White Version | Purrloin". 2011-02-10 khòaⁿ--ê. ↑ "Pokémon Black Version and Pokémon White Version | Liepard". 2011-02-10 khòaⁿ--ê. ↑ "Pokémon Black Version and Pokémon White Version | Pansage". 2011-02-07 khòaⁿ--ê. ↑ "Pokémon Black Version and Pokémon White Version | Pansear". 2011-02-10 khòaⁿ--ê. ↑ "Pokémon Black Version and Pokémon White Version | Panpour". 2011-02-10 khòaⁿ--ê. ↑ "Munna". Pokémon Black Version and Pokémon White Version: Official Video Game Site. The Pokémon Company International, Inc. 27 December 2010 khòaⁿ--ê. ↑ "Pokémon Black Version and Pokémon White Version | Musharna". 2011-11-14 khòaⁿ--ê. ↑ "Pidove". Pokémon Black Version and Pokémon White Version: Official Video Game Site. The Pokémon Company International, Inc. 27 December 2010 khòaⁿ--ê. ↑ 81.0 81.1 81.2 81.3 81.4 81.5 81.6 81.7 81.8 81.9 "ポケモンメダルコレクション ベストウイッシュ2". Bandai Co., Ltd. 28 January 2011 khòaⁿ--ê. ↑ 82.0 82.1 82.2 "ポケモンしょうひん ゲーム". Takara Tomy. 26 May 2011 khòaⁿ--ê. ↑ "Blitzle". Pokémon Black Version and Pokémon White Version: Official Video Game Site. The Pokémon Company International, Inc. 27 December 2010 khòaⁿ--ê. ↑ 84.0 84.1 84.2 84.3 84.4 84.5 84.6 "Pokémon Black and White merchandise". 15 March 2010 khòaⁿ--ê. ↑ "Gigalith". Pokémon Black Version and Pokémon White Version: Official Video Game Site. The Pokémon Company International, Inc. 27 December 2010 khòaⁿ--ê. ↑ "Pokémon Black Version and Pokémon White Version | Woobat". 2011-11-14 khòaⁿ--ê. ↑ "Pokémon Black Version and Pokémon White Version | Drilbur". 2011-11-14 khòaⁿ--ê. ↑ "Pokémon Black Version and Pokémon White Version | Excadrill". 2011-02-07 khòaⁿ--ê. ↑ "Pokémon Black Version and Pokémon White Version | Audino". 2011-02-10 khòaⁿ--ê. ↑ "Pokémon Black Version and Pokémon White Version | Sewaddle". 2011-02-07 khòaⁿ--ê. ↑ "Pokémon Black Version and Pokémon White Version | Basculin". 2011-02-07 khòaⁿ--ê. ↑ "Sandile". Pokémon Black Version and Pokémon White Version: Official Video Game Site. The Pokémon Company International, Inc. 27 December 2010 khòaⁿ--ê. ↑ "Darmanitan". Pokémon Black Version and Pokémon White Version: Official Video Game Site. The Pokémon Company International, Inc. 27 December 2010 khòaⁿ--ê. ↑ "Pokémon Black Version and Pokémon White Version | Yamask". 2011-02-10 khòaⁿ--ê. ↑ "Pokémon Black Version and Pokémon White Version | Cofagrigus". 2011-11-14 khòaⁿ--ê. 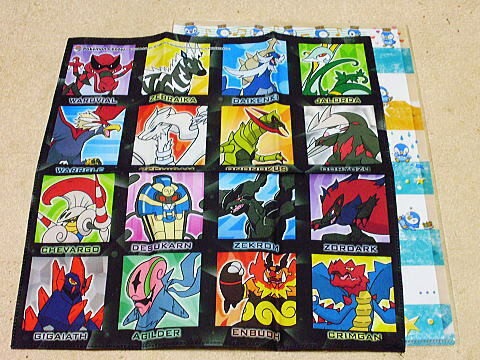 ↑ 98.0 98.1 98.2 98.3 "Pokémon Black and White merchandise". 6 April 2011 khòaⁿ--ê. ↑ 99.0 99.1 "Two New Dark-Type Pokémon Come to Light". Pokémon.com. The Pokémon Company International, Inc. 6 December 2010. 6 December 2010 khòaⁿ--ê. ↑ "Minccino". Pokémon Black Version and Pokémon White Version: Official Video Game Site. The Pokémon Company International, Inc. 27 December 2010 khòaⁿ--ê. ↑ "Pokémon Black Version and Pokémon White Version | Gothitelle". 2011-11-14 khòaⁿ--ê. ↑ "Pokémon Black Version and Pokémon White Version | Reuniclus". 2011-11-14 khòaⁿ--ê. ↑ "Pokémon Black Version and Pokémon White Version | Swanna". 2011-02-07 khòaⁿ--ê. ↑ "Pokémon Black Version and Pokémon White Version | Deerling". 2011-02-07 khòaⁿ--ê. ↑ "Pokémon Black Version and Pokémon White Version | Sawsbuck". 2011-02-10 khòaⁿ--ê. ↑ "Pokémon Black Version and Pokémon White Version | Emolga". 2011-02-10 khòaⁿ--ê. ↑ "Pokémon Black Version and Pokémon White Version | Alomomola". 2011-02-07 khòaⁿ--ê. ↑ "Pokémon Black Version and Pokémon White Version | Galvantula". 2011-02-10 khòaⁿ--ê. ↑ "Klink". Pokémon Black Version and Pokémon White Version: Official Video Game Site. The Pokémon Company International, Inc. 27 December 2010 khòaⁿ--ê. ↑ "Pokémon Black Version and Pokémon White Version | Axew". 2011-11-14 khòaⁿ--ê. ↑ "Pokémon Black Version and Pokémon White Version | Fraxure". The Pokémon Company International, Inc. 2011-02-10 khòaⁿ--ê. ↑ "Pokémon Black Version and Pokémon White Version | Haxorus". The Pokémon Company International, Inc. 2011-02-10 khòaⁿ--ê. ↑ "Pokémon Black Version and Pokémon White Version | Braviary". 2011-11-14 khòaⁿ--ê. ↑ 121.0 121.1 "A New Generation of Pokémon...An All-New Adventure!". Pokémon.com. The Pokémon Company International, Inc. 28 May 2010. 27 July 2010 khòaⁿ--ê. ↑ "Mythical Pokémon Magearna officially announced". GameZone. 16 February 2016 khòaⁿ--ê.
Chit ia̍h siāng bóe tī 2018-nî 2-goe̍h 13-ji̍t (Pài-jī), 03:58 ū pian-chi̍p--koè.